Located in 103 Reese Phifer, his space is perfect for student organization meetings, class project collaboration or personal study. The conference room seats 10 and is equipped with Apple TV connectivity on the extra-large, high definition monitor. There is also a collaboration room furnished with white boards for groupthink sessions and brainstorming. The main room is outfitted with sofas and tables, for catching a break between classes. 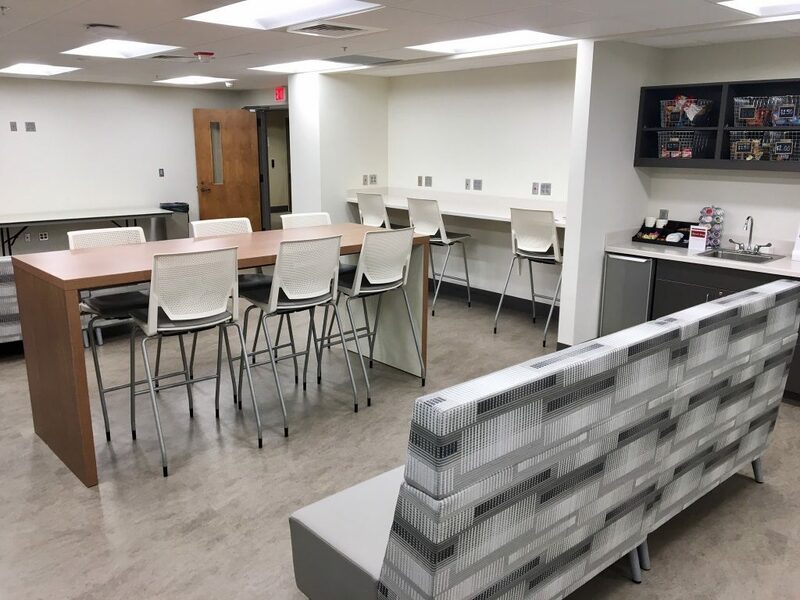 The Student Executive Council regularly offers refreshments in the student lounge—including a variety of snacks, coffee and energy drinks—as a fundraiser for the SEC’s Student Organization Fund. This fund helps C&IS student organizations secure resources for on-campus events, travel expenses and general organization needs. At the C&IS Media Writing Center, upper-level and graduate students provide assistance for media writing assignments and coursework. Sessions are held in the C&IS Commons on the second floor of Reese Phifer Hall. Students may walk in for assistance as mentors do not take appointments. Mentors use a coaching method of instruction to assist students in identifying areas of improvement while guiding students toward their own solutions. Mentors are instructed to avoid simply proofreading copy and, prior to visiting the center, students should edit the text for which they are seeking help. In most cases, sessions are limited to 30 minutes. Monday 9 a.m. – 4:30 p.m.
Wednesday 10 a.m – 3:30 p.m. Promoting individual and collaborative study and research, the C&IS Commons offer discipline-based library and technology services for students, faculty, staff, and alumni of the College. The C&IS Commons maintains collections of books, academic journals, trade magazines, Alabama newspapers, course reserves, and DVDs. 28 workstations are open for general use during the day. Small group study rooms are available for reservation. These study rooms accommodate three to six students and are equipped with wifi and televisions. To reserve a study room, stop by the C&IS Commons or call 205-348-8668. Created to assist individuals in clarifying and crafting their message, cultivating a dynamic delivery and calming public speaking anxiety, The Speaking Studio is a community-wide resource and available for use both on campus and off campus. The Speaking Studio is staffed by trained public speaking consultants who facilitate the recording and immediate feedback of individual and group presentations. For more on The Speaking Studio, or to schedule an appointment, visit their website. Below is a complete listing of computer labs in Reese Phifer Hall. For assistance regarding software and hardware operation, please contact C&IS Technology Services. To print wirelessly from a personal computer, visit cis.ua.edu/printing. Monday – Thursday: 5 p.m. – 10 p.m.
Monday – Thursday: 7 a.m. – 11 p.m.
Friday: 7 a.m. – 4:45 p.m.
Monday – Thursday: 8 a.m – 9 p.m.
Friday: 8 a.m. – 4:45 p.m.
Sunday: 4 p.m. – 11 p.m.
‡ College wide open hours.